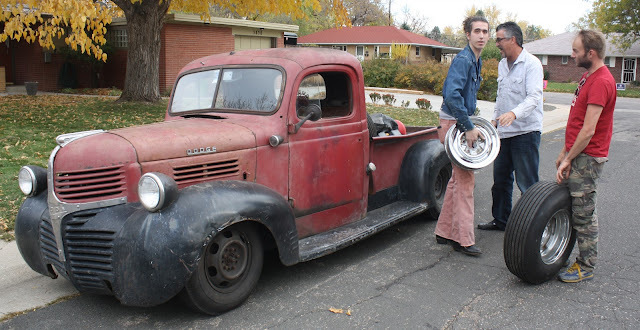 We had the good fortune of spending the weekend with Sean Johnstun aka Fat Lucky's, who stopped by to bring the chrome reverse wheels and rear tires for the roadster. Sean was making a trek from his old home in Austin to Kansas and back to Burbank, CA, where he's setting up shop with a buddy who does high-end Merecedes work. While here, Sean took a run over to the secret bunker where work on the roadster is resuming. While there, we had a chance to visit and I asked him to weigh in for the design direction of the roadster, particularly its interior. As Sean soon found out, I had a multitude of choices for gauges. 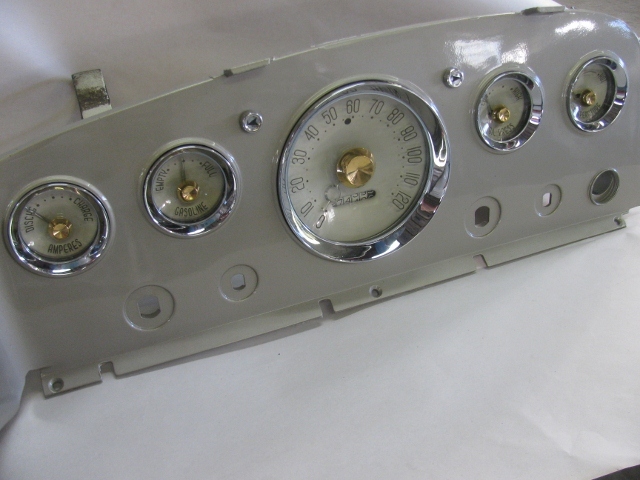 The only thing I knew for sure is that I wanted to run original equipment gauges form a fifties car. Sean put in a strong recommendation that I use the Desoto gauges I pulled out of my favorite wrecking yard in Seguin, Texas a couple years ago. Sean was a big fan of the white faces and gold accents on them. He felt that the subtle colors would key beautifully off of the turquoise exterior paint and play nicely against my plan for a white pearl interior. While on the subject, I asked him what he would do with the interior. His answer? White pearl with gold piping, to play off of the gauges. That was exactly the kind of sage advice I was looking for. We also talked about my plan for a padded center console and interior door panels with late fifties or early sixties arm rests. If all goes well, it's my intention to cut Sean loose on the interior once the car is up and running. Naturally, we're a long ways out from that stage, but it's nice to have the best upholstery guy on the planet weigh in. Sean left Denver Sunday headed towards Sante Fe in his '42 Dodge truck. What he left behind was a ton of good advice about keeping the car's interior relatively simple, which is a fine art in and of itself. When the time comes to have the gauges rebuilt, Redline Gauges will likely get the nod.